Smith & Vandiver was founded in 1979 and is a natural bath, body and skincare company. The new Spa…Ah line is full of products with a purpose. Lavender is a stress reliever and the Spa…Ah Lavender line is meant to help put you at ease. So take a moment for yourself and relax. Start with a warm bath and Stress Release Efferé Bath Fizzy. This indulgent bath fizz with pamper your skin and help with softening with it’s moisturizing sunflower oil and mineral-rich sea salts. This will turn your tub into a delightful spa-like experience. Next slather your skin with a lush body butter to moisturize your skin while melting away stress. Pure essential oils of Lavender and Bergamot calm, while Green Tea and Bamboo extracts, Aloe Vera and Shea Butter hydrate, repair and smooth. This will leave your skin feeling soft and hydrated. Need a bit of a massage? Or maybe just just a pick me up? Their Lavender and Bergamot essential oil fragrance blend combined with a light touch and smooth strokes helps release stress and tension. Pay special attention to neck, shoulders and backs of legs where tension is held. This all natural oil base is blended for the perfect slip without feeling greasy. Non Staining. Disclosure: The bloggers participating in this event have NOT been compensated for this post. Networking Perks provides honest opinions, beliefs or experiences on products reviewed. 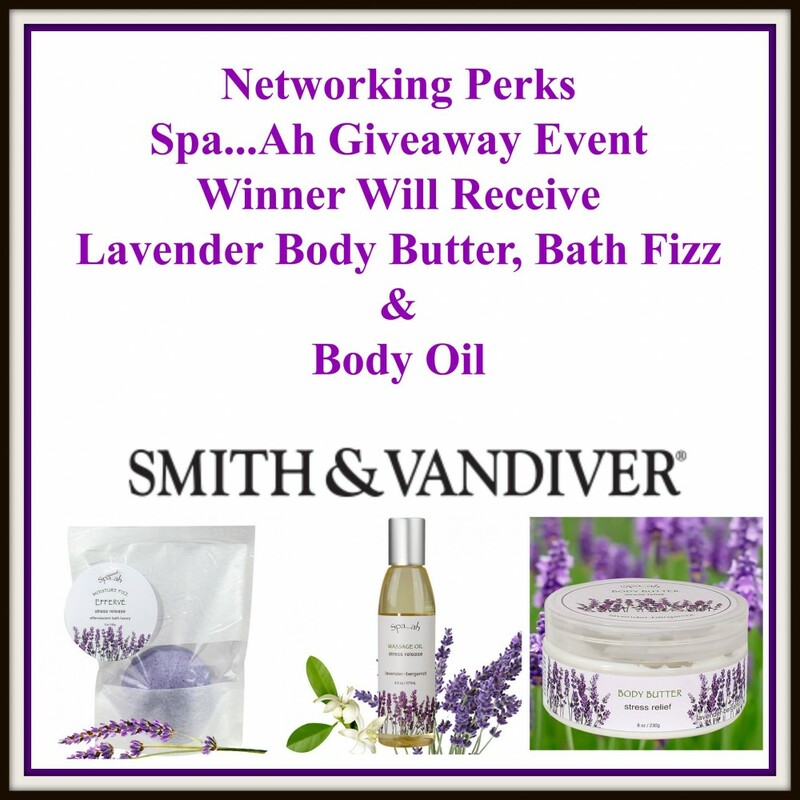 Networking Perks is NOT responsible for prize fulfillment, Smith & Vandiver will be sending the prize directly to the winner. This event is in no way associated with, sponsored, administered, or endorsed by Twitter, Google, Pinterest, Facebook or any other social media. If you have any questions or would like help in promoting your own product please contact me at Joie@NetworkingPerks.com . The disclosure is done in accordance with the Federal Trade Commission 10 CFR, Part 255 Guides concerning the use of Endorsements and Testimonials in Advertising. Previous post: Have a sundae, Make any day a fundae with Smuckers!